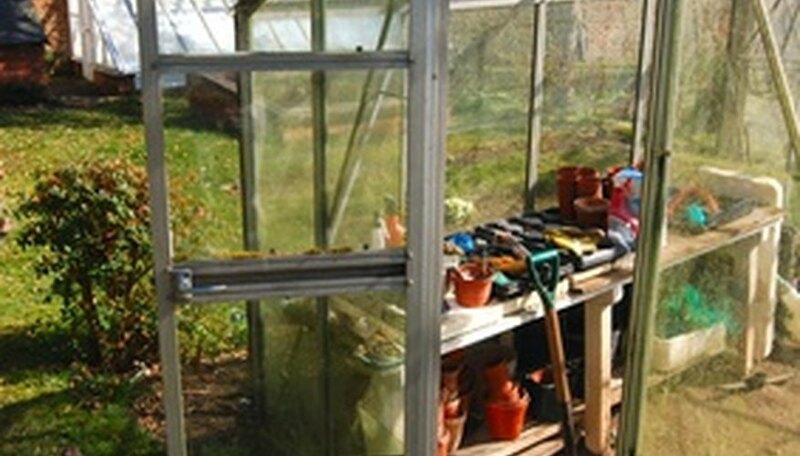 Greenhouses work well for starting seed transplants or growing specialty plants such as orchids. Installing shade cloth over the greenhouse’s roof and sides cuts down on the sun’s intensity, creating a cool, shadier environment where plants will not burn. Many manufacturers guarantee their shade cloth to last up to 10 years, so gardeners will not have to replace it for quite a few years. Shade cloth comes in a variety of colors, sizes and shade percentages and many stores will cut it to size. Measure the length and width of the roof, as well as the distance from the top of the roof two-thirds of the way down each side. Measure so the cloth connects to the greenhouse frames and will not overhang on the sides. The sides are not completely covered, but covered from top to bottom just enough to block out direct sunlight entering through the sides. Cut your shade cloth to the size of your measurements. For example, if your greenhouse is 12-feet square and 9 feet tall, you need one long piece to cover the roof and two sides that is 12 feet wide by 24 feet long and two separate side pieces that are 12 feet wide by 6 feet long. Pull the long roof section of shade cloth over the roof, allowing equal portions to hang off each of the two sides. Straighten the cloth as required to fit appropriately over the frame. Having an extra person and a ladder will help in completing this step. Start at one corner of the top of the roof’s frame and staple the shade cloth in place. Pull the cloth snug as your work and place a staple approximately every 12 inches along the wooden frame until the roof section is in place. Pull the two hanging sides tight against the framework. Starting at the top of one side and working towards the ground, place a staple approximately every 12 inches into the frame to hold the shade cloth snug against it. Attach the two remaining pieces of shade cloth for the sides in place. Line the shade cloth up to the roof and staple the top of the cloth to the roof frame, pulling tight so the cloth does not sag. Staple each side of the cloth to the frame, working from top to bottom, continuing until the greenhouse is completed. Select the type of shade cloth best suited for your needs. Shade cloth comes in either knitted or woven. Knitted cloth can be more expensive but does not unravel when cut, while woven can be cheaper but can unravel when cut. Both work well in blocking the sun. Consider what you are growing to select a cloth that provides the appropriate shade percentage. Shade cloth comes in shade percentages of 30 through 90 percent (in increments of 10 percent), with the higher percentage blocking out the most sun. Veggies and bedding plants grow well under 40 percent, while 70 percent works well if growing ferns and orchids.